A campaign calling for the Turkish President Recep Tayyip Erdogan to step down has flooded social media. The campaign comes after Mr Erdogan, who has ruled Turkey for 15 years, said in a speech to Parliament on Tuesday that "if one day our nation says 'enough', then we will step aside". Seizing up on this statement, many Turks have taken to the hashtag #TAMAM, which translates as 'enough', to say they have indeed had enough. The hashtag has been used almost two million times since Tuesday evening, with many social media users strongly criticising the president and the ruling AK Party. As the trend gathered momentum, pro-government accounts mobilised to launch a counter hashtag, #DEVAM - which translates as "carry on". The showdown between the rival campaigns has been called "one of the largest political hashtag wars in internet history" by Professor Akin Unver, who is a Fellow of Cyber Research Program at the Centre for Economic and Foreign Policy Research. One Instagram user depicted the battle between #TAMAM and #DEVAM as a fight between superheroes. 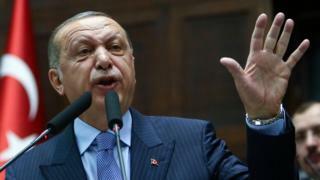 Mr Erdogan's comments come amid heightened political tensions after the president called a snap election to be held on 24 June. Muharrem Ince, who is the presidential candidate of the opposition Republican Peoples' Party used the phrase to suggest "time's up" for Mr Erdogan. Syrian cartoonist Iad Tawil used the hashtag to share an illustration suggesting Mr Erdogan may be haunted by his "TAMAM" comments. Many thousands simply tweeted #TAMAM, while others got creative with the ways they shared the anti-Erdogan slogan. Some spelt it out with green peppers and some used their limbs to form the word. Despite the rapid growth of the hashtag and the fiercely critical nature of many posts, Mr Erdogan remains popular in Turkey having brought sustained economic growth to the country. The rival hashtag #DEVAM was launched later on Tuesday by pro-government users and has been used over 300,000 times. Foreign Minister Mevlut Cavusoglu used the hashtag to claim the government "will carry on with our blessed cause for a more prosperous and powerful Turkey,"
Some Erdogan supporters used variations of #DEVAM to ask those critical of the president what they have had enough of. "Enough of what? Of the fight against terror? Of a completely independent Turkey that stands tall against the world? Of the homeland? Of the state? Enough of what? We will continue to the end" one user wrote. Other users linked the anti-Erdogan #TAMAM campaign to the 2013 anti-government Gezi Park protests. Taylan Kulaçoğlu posted that the authorities were "mad about this TAMAM issue... because it reminds them of the opposition that organised on Twitter prior to Gezi". Bu T A M A M mevzusuna AKP'lierin çıldırmasının tek sebebi sadece seçimler değil, Gezi öncesi Twitterda örgütlenen muhallefeti anımsattığı için bu denli yükleniyorlar, korkuları biraz da bundan.. While #TAMAM has been widely used to criticise the government, censorship by the Turkish authorities is prevalent and well documented. Twitter's Transparency report 2017 revealed that Turkey was at the top of the list of countries that had asked the social media platform to remove content. Reflecting on this governmental control, prominent lawyer Kerem Altiparmak suggested that if a million people are using the term TAMAM on social media, the number of people who wish to express the notion, but don't, must be much higher. İşe başvururken, terfi alırken, ihaleye girerken, nefes alırken bile sosyal medya hesaplarına bakılıyor. Bu korku iklimine rağmen milyonlarca T A M A M yazılıyorsa gerçek T A M A M ların on milyonlarla ifade edilmesi gerekiyor. Turkish authorities have previously restricted access to social media sites including Twitter and Facebook, and blocked all access to Wikipedia in 2017. Wikipedia founder Jimmy Wales, referenced the hashtag while calling on Mr Erdogan to "unblock Wikipedia and to listen to the people".